Also under the tree were a miniature tin toy grocery shop, the Corner Grocer, made by Wolverine in the 1930s, and a bunch of old Halloween decorations from the 1920s - 40s. What did Santa bring you? Tell us in the comments! 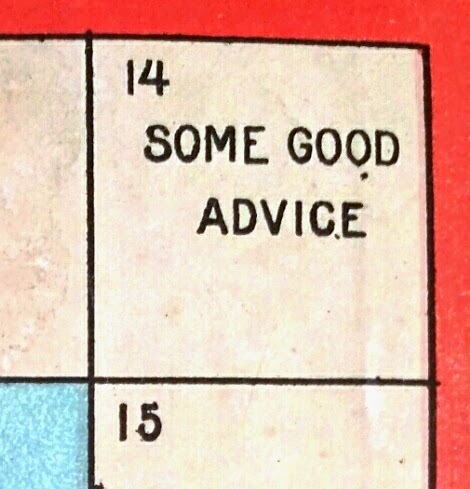 What better way could there be for a Victorian child to while away the days until Christmas than by playing this board game? 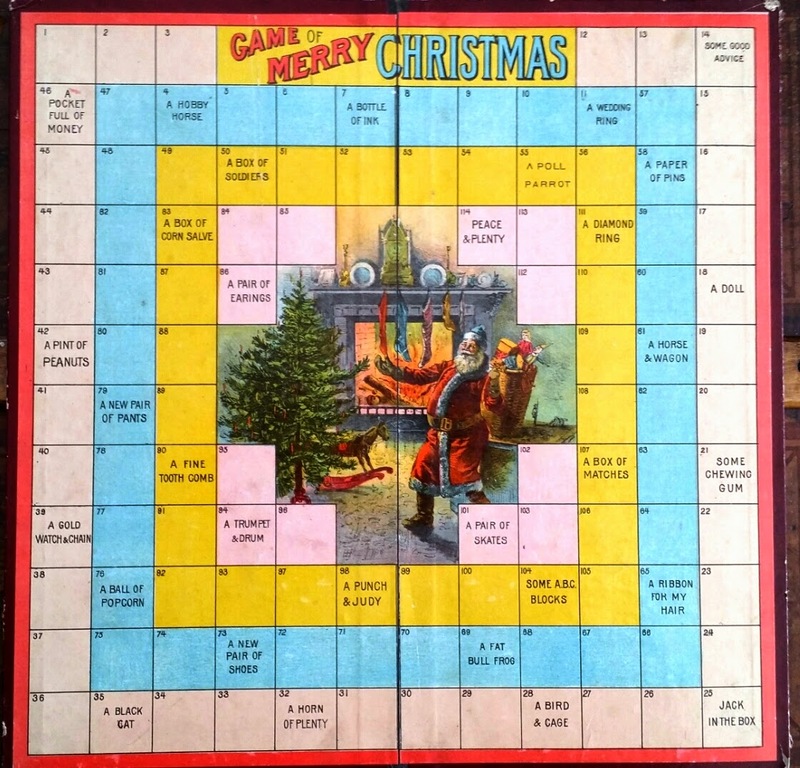 The Game of Merry Christmas, or, What Will Santa Claus Bring, was produced by the J.H. Singer Company of New York in 1890. 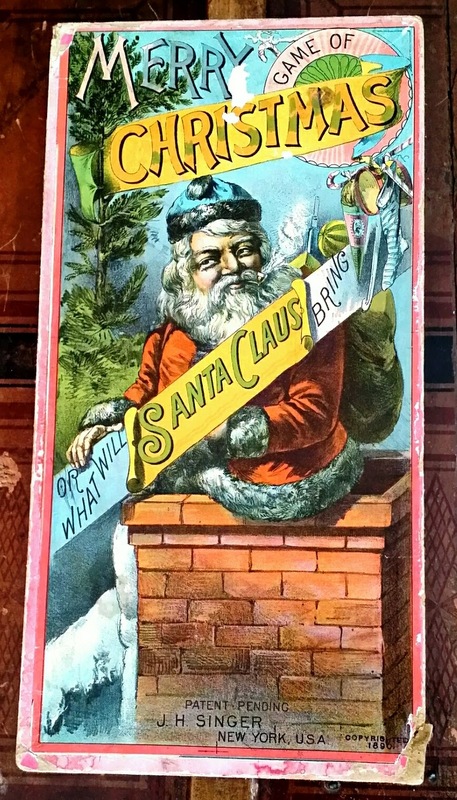 The beautifully lithographed box cover depicts Santa, clad in a fur trimmed suit and with the stump of a clay pipe clenched in his teeth, about to head down a chimney with a sack full of toys. Inside, the board features an illustration of Santa about to deliver his gifts below the Christmas tree. A rocking horse is already in place. The game itself is a simple numbered track. Players roll the die and then move along the board. If they land on a space that is labelled with a gift, that's what they'll be getting for Christmas. 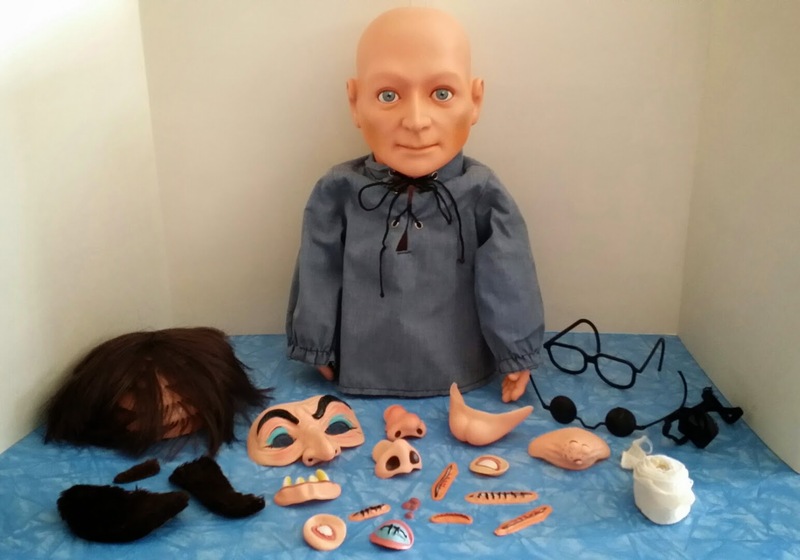 There are some wonderful items listed: a Punch and Judy show, a hobby horse, a doll, and a box of tin soldiers are just a few of the options. 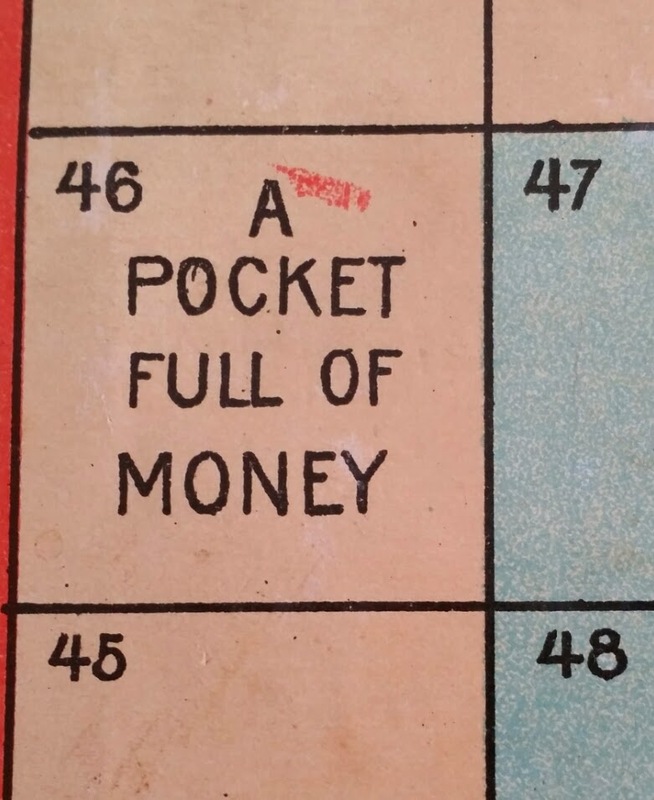 But lest we assume materialism is an exclusive feature of our modern Christmas, note that "a pocket full of money" is one of the gift possibilities. 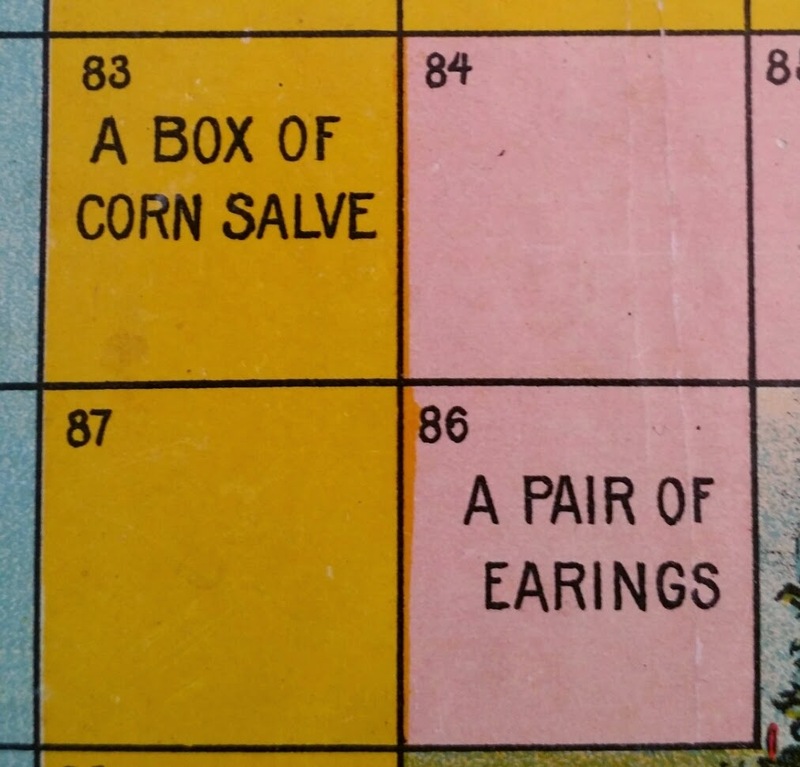 There are also some present pitfalls to be avoided: I can imagine no one wanted to land on "a box of corn salve," or "some good advice." I hope Santa brings you just what you want, and no corn salve! 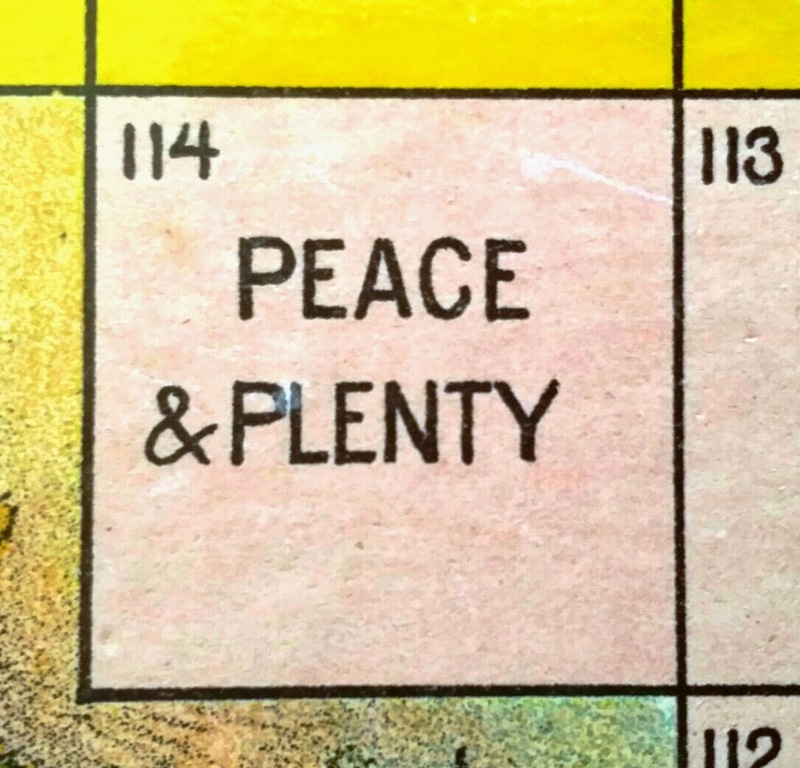 May you have space number 114 this year and always. Merry Christmas everyone! 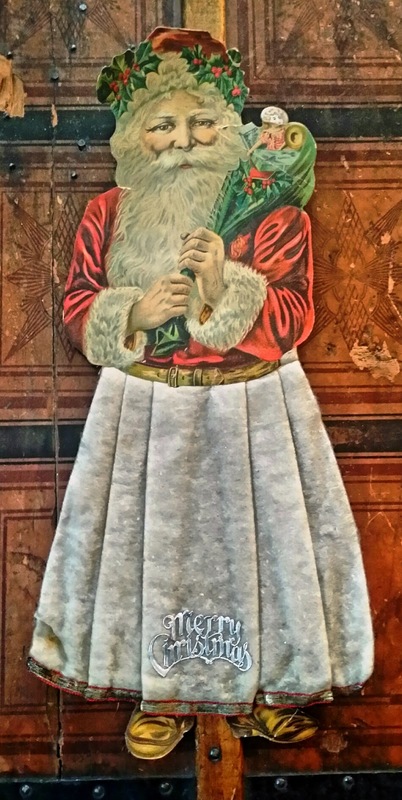 Made in Germany circa the 1890s, this large diecut Santa is 18 inches tall and features a cotton batting cloak with gilt paper embellishment. The Santa came from an elderly woman whose family had hung it each Christmas in their house from the 1890s all the way to 2010. It's incredible that this fragile piece survived so well for so long, and intriguing to imagine all the family Christmases it witnessed over those 120 years! 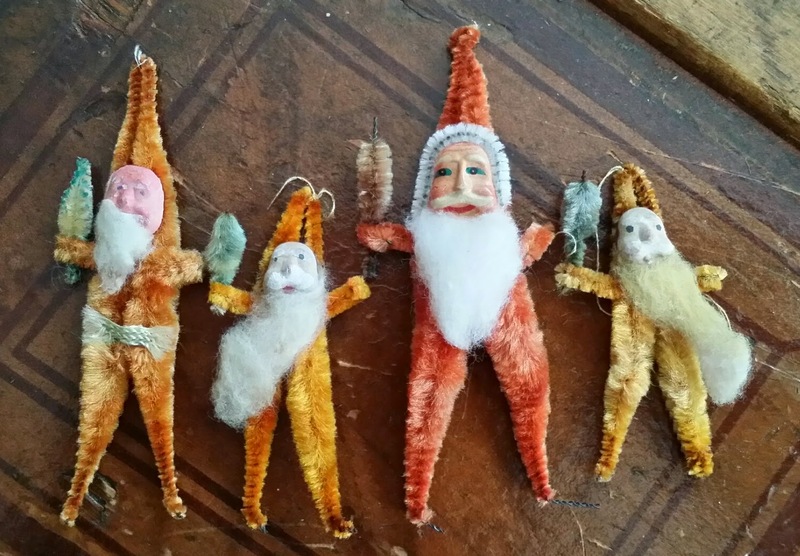 These little chenille Santas were made by the millions in Japan and sold in American dime stores from the 1930s to '50s. Averaging 2.5 inches tall, their little faces are usually made of molded clay, and they each have their own unique character. Closely related to the chenille Santa is the cotton batting Santa. These are harder to find than the chenilles, probably because of their greater fragility. When new, these little Santas decorated Christmas trees and gift packages. Now they are highly sought by collectors and their prices have risen accordingly, typically $10-13 each, but occasionally as high as $28 for an early or unusual example. The lucky hunter can sometimes still find them for a few cents at garage sales, so it pays to dig through boxes of vintage Christmas decorations whenever you can. 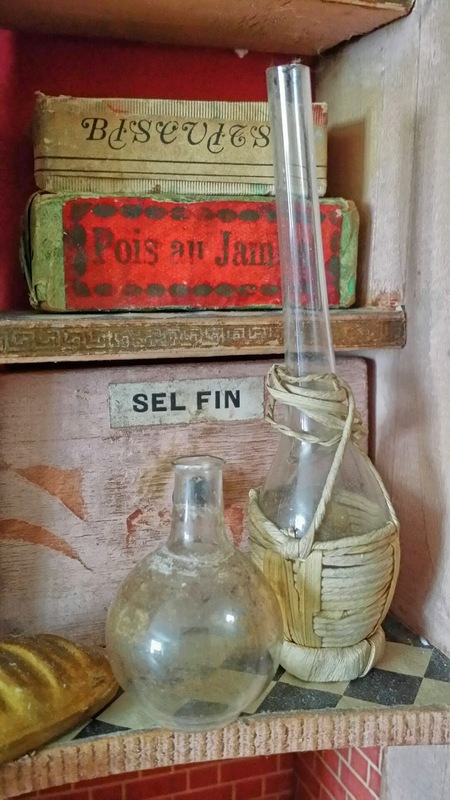 I keep my stash in this old glass candy container, where they are safely lodged in the chimney. Ninety years ago, children were delighted to find candy in their Christmas stockings, just as they are today. 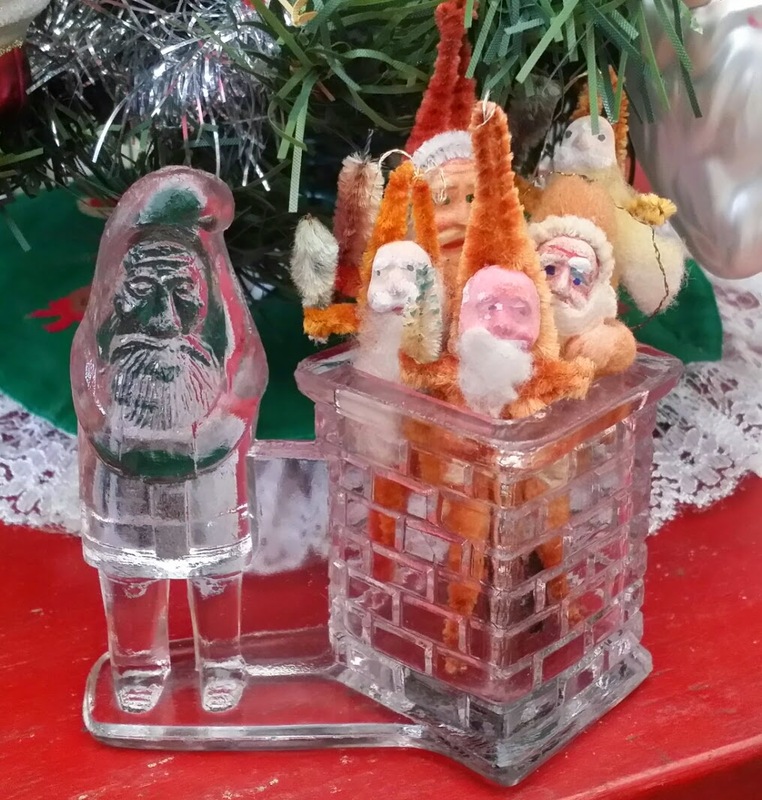 But while modern children might see plastic PEZ dispensers peeking out of their stocking tops, children of the 1920s would have found these beautiful glass candy containers nestled within. 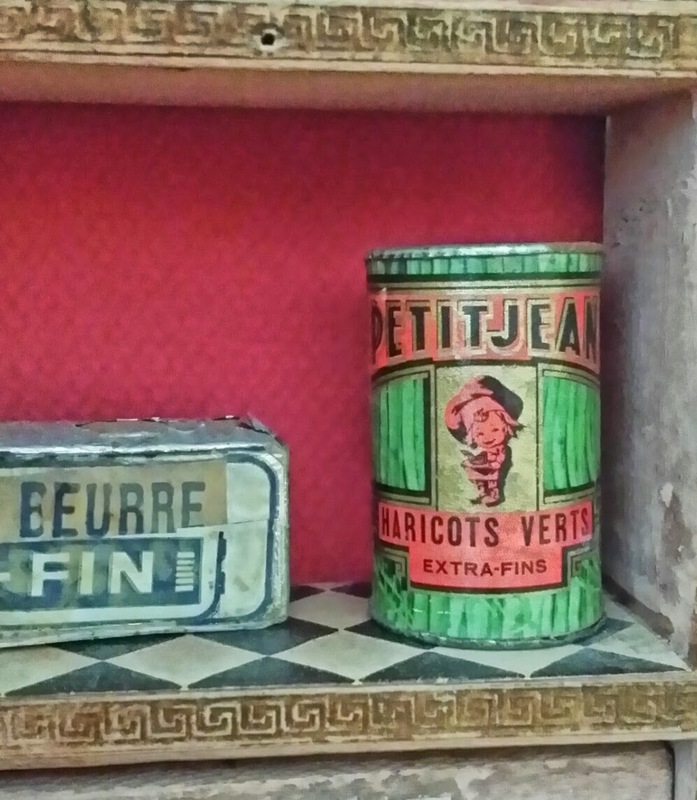 Once the candy inside was gone, children often saved the containers to use as toys, and so they have been preserved through the years for lucky collectors to discover. 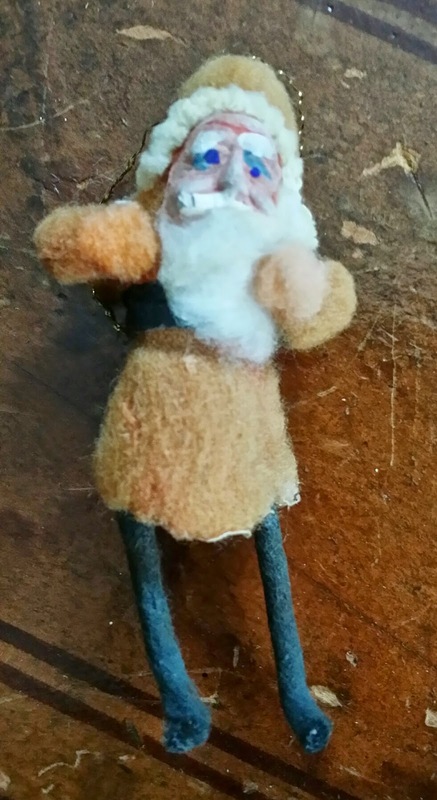 This 4.5 inch container depicts a belsnickel-like Santa in a long coat and hood. It still has its original metal lid capping the bottom opening. When new, it would have been colorfully painted (remnants are visible on the face) but even bare, it's a beautiful thing, full of character. 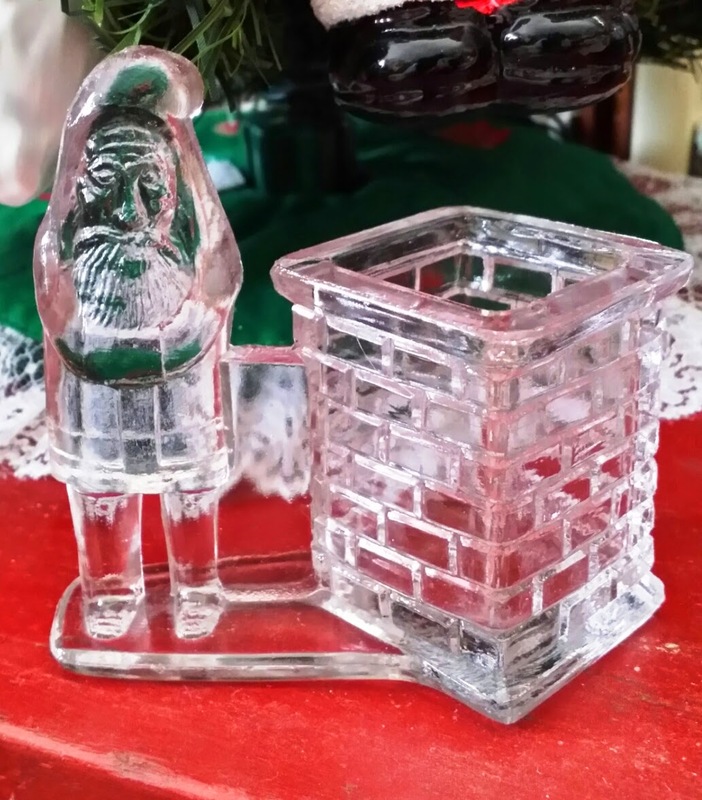 This container featuring Santa and a chimney is just under 4 inches tall. Originally the chimney would have been filled with colorful round, pellet-like candies, and capped with a thin metal lid. They just don't make candy packaging like this anymore! December is here at last, the toy collectors' favorite time of year. 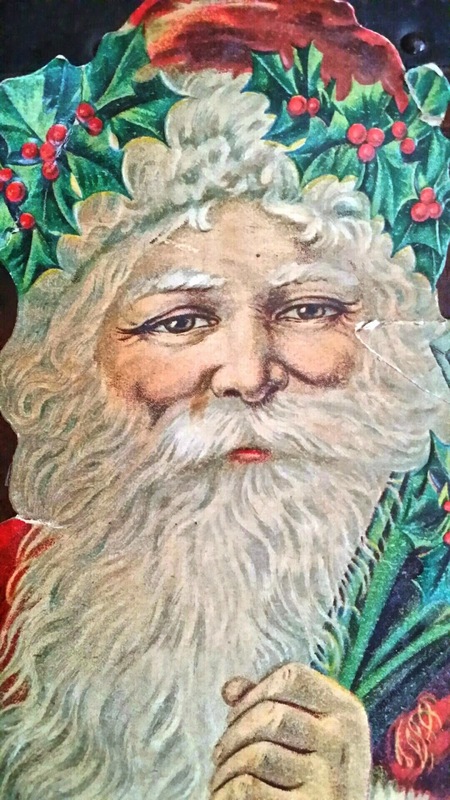 This month I'll be featuring a variety of Santa Claus themed items from my collection, including candy containers, decorations, and a rare board game from 1890. First up is this fabulous postcard, circa 1906. 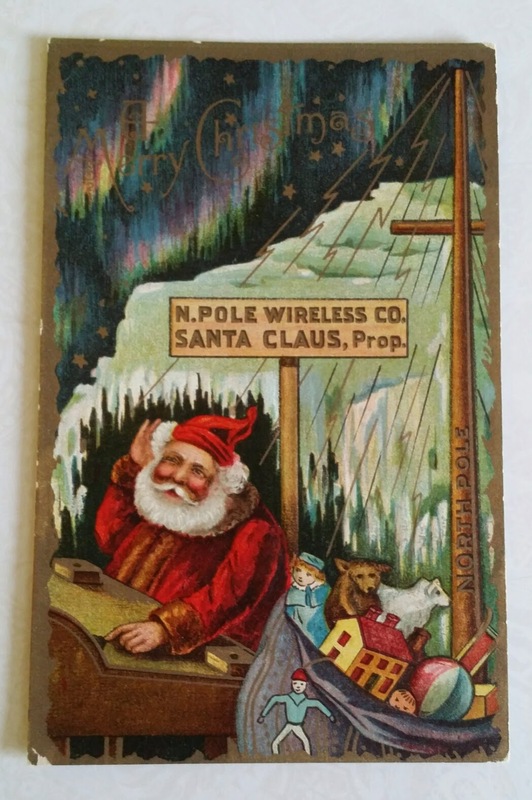 The colorful card depicts a busy Santa listening on the wireless station at the North Pole. Looks like he's receiving lots of orders (I got mine in early.) Note the Northern Lights flickering overhead. 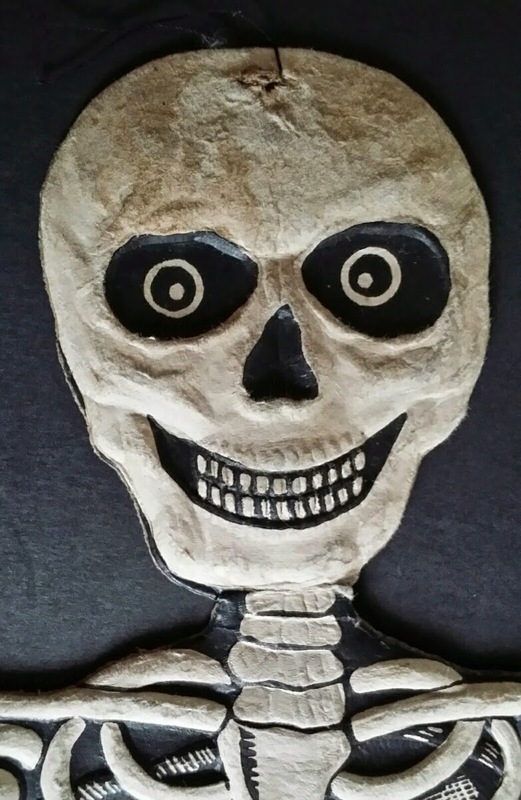 Found in a local antique shop just in time for Halloween, this heavily embossed, die cut skeleton was made in Germany circa 1920, and measures 19 inches tall. It had long been on my Halloween wish list; I'd only ever seen it in books before. Known as the "waving skeleton," it's much more unusual, and uncommon, than the typical jointed model with posable limbs. 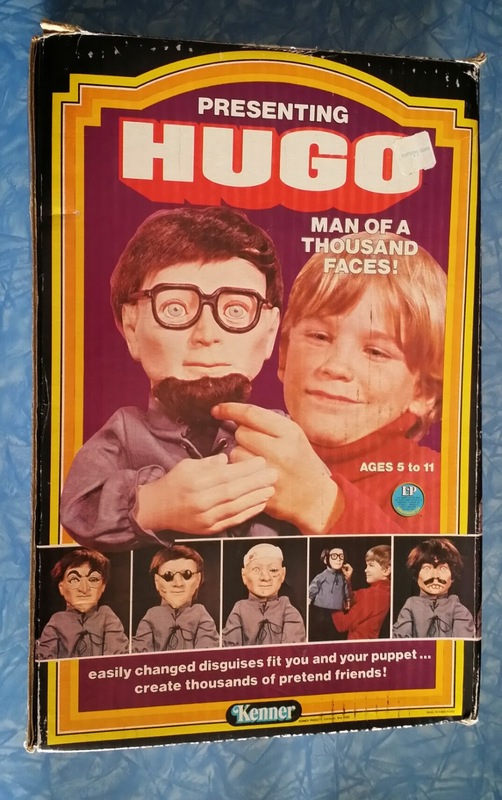 Presenting one of the creepiest and most unsettling toys ever made: Hugo, Man of a Thousand Faces, released by Kenner in 1975. 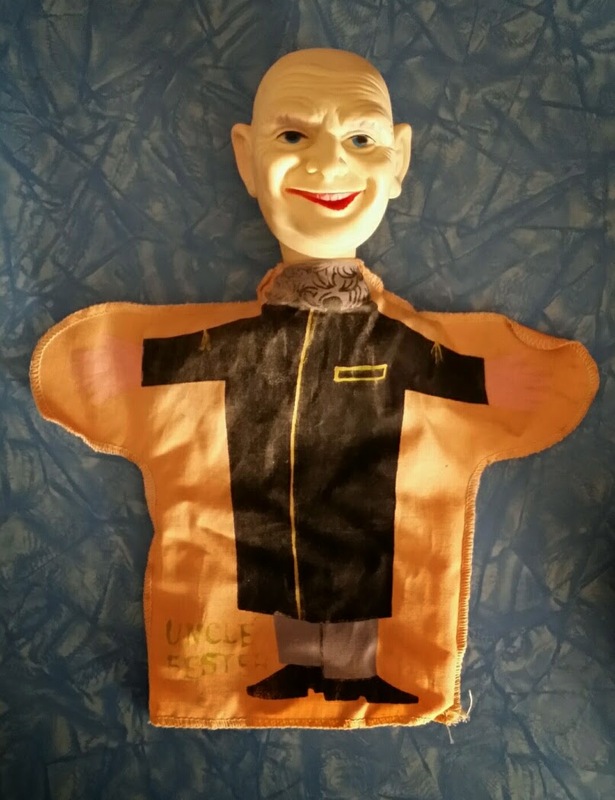 Hugo was a 12 inch vinyl puppet/mannequin head who came wearing an artist's smock and with a set of facial disguise accessories. 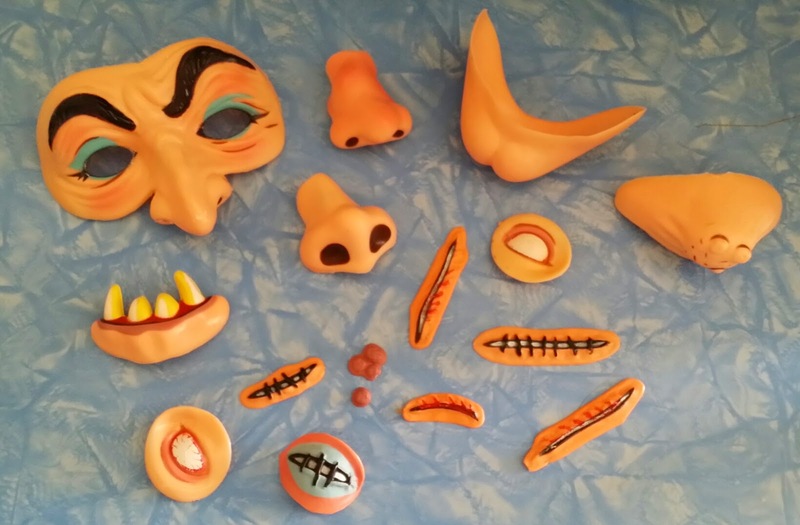 A tube of special glue allowed kids to attach the disguise pieces in a seemingly endless array of combinations, creating a huge variety of characters. A thousand, allegedly. 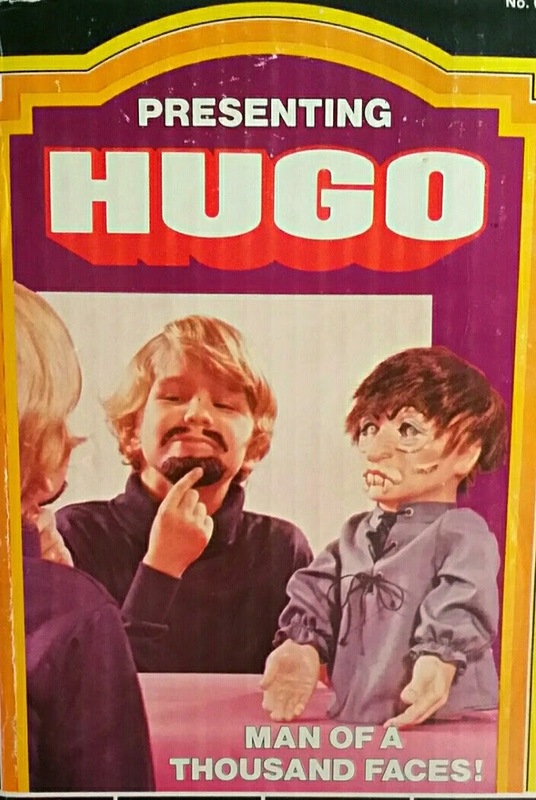 Children were encouraged to use the disguise pieces on themselves as well as on Hugo, and Kenner suggested Hugo could even serve as a special "friend." 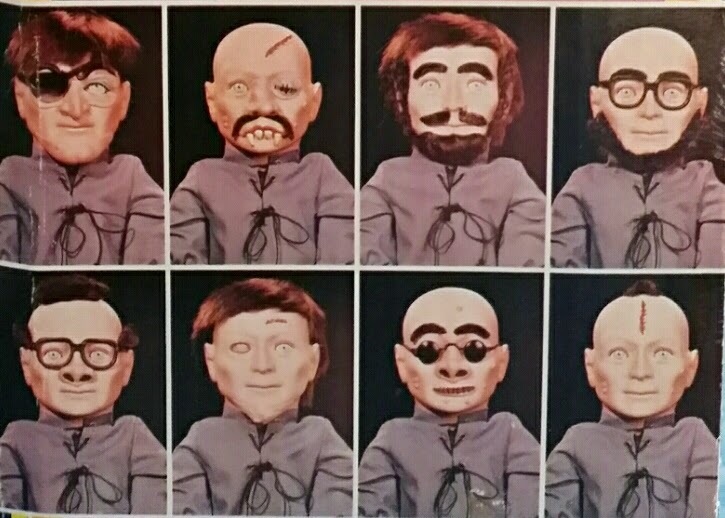 These are not the sort of puppet friends you'd find in Mr. Rogers' Neighborhood. I'm sure Kenner's intentions were good. 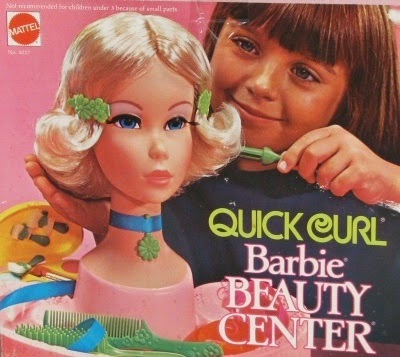 After all, Mattel's Barbie styling heads had been best-sellers for several years by this point, and little girls across the country were thrilled with the opportunity offered by these playsets to do hair and makeup. There's just something unsettling about Hugo: his dead stare; the way he appears to be sizing the viewer up, waiting for just the right moment to begin creeping across the floor towards you; his stare; and again, his stare. Oh, the stare is so unnerving. Just look at it! I can't bear to. As I type this, I have to make sure I can't see that part of the above picture. Let's move on. 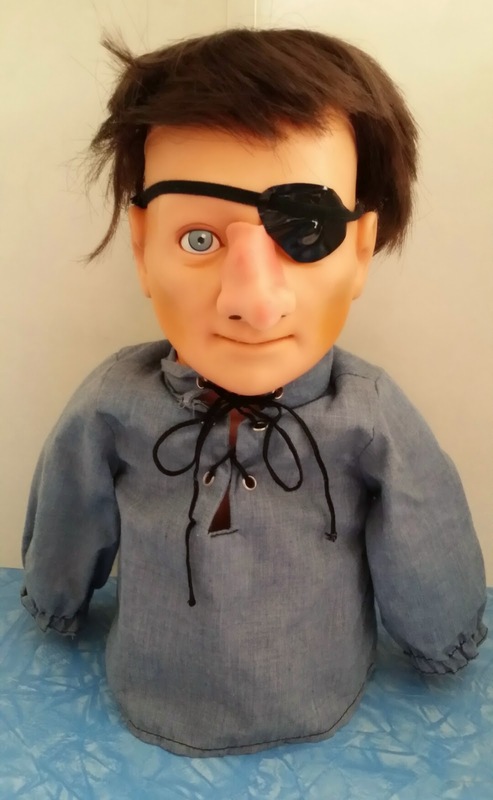 Adding the accessories (which include hairpieces, false chins and teeth, fake noses, glasses, scars, warts, an eyepatch, a bandage, and more) doesn't really help. In most cases, it only makes him even creepier. "I can still see you," says Hugo. 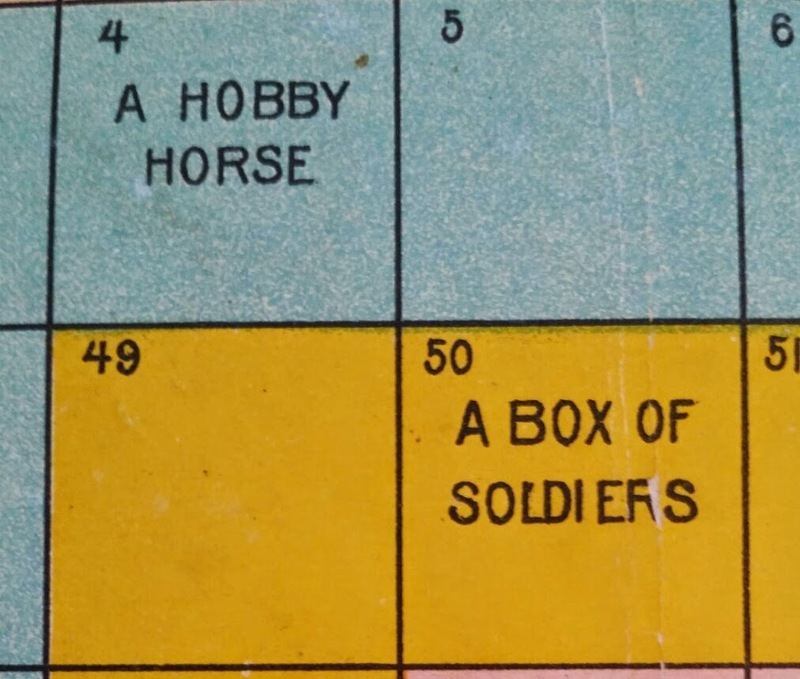 Suggestions from the box. Shudder. The least unnerving version of Hugo I've come up with is this one, which I call Disco Hugo. 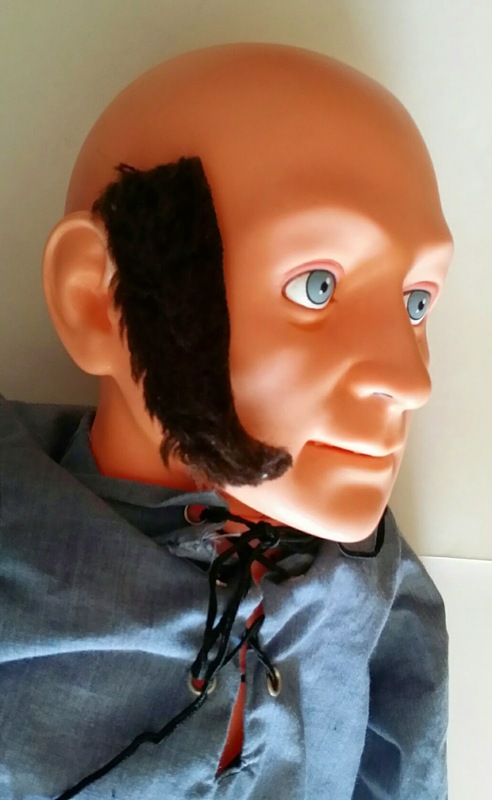 His crazy 70's sideburns make him somewhat more comical and easier to bear, as long as he's not looking at you directly. It's nearly Halloween, and so time for a visit with the Addams Family. 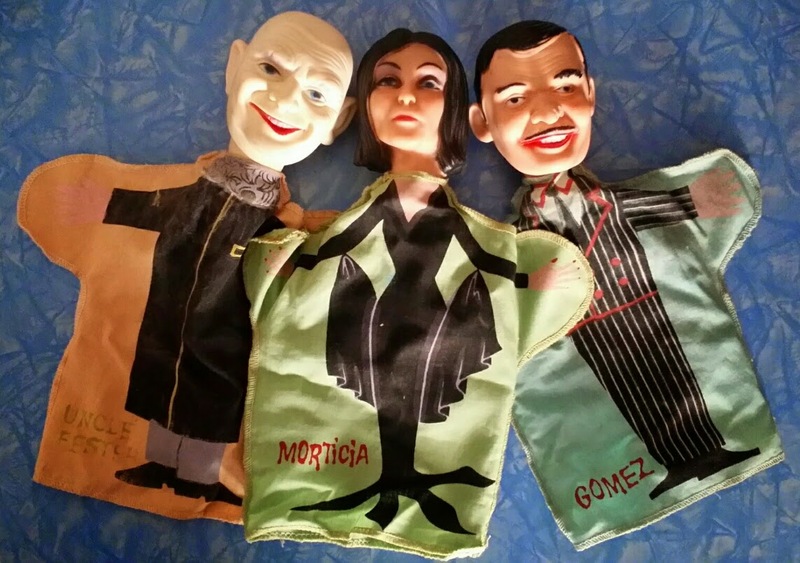 These hand puppets were made in 1964 by the Ideal Toy Corporation, and feature molded vinyl heads in the likenesses of the television actors, attached to printed cloth puppet sleeves. 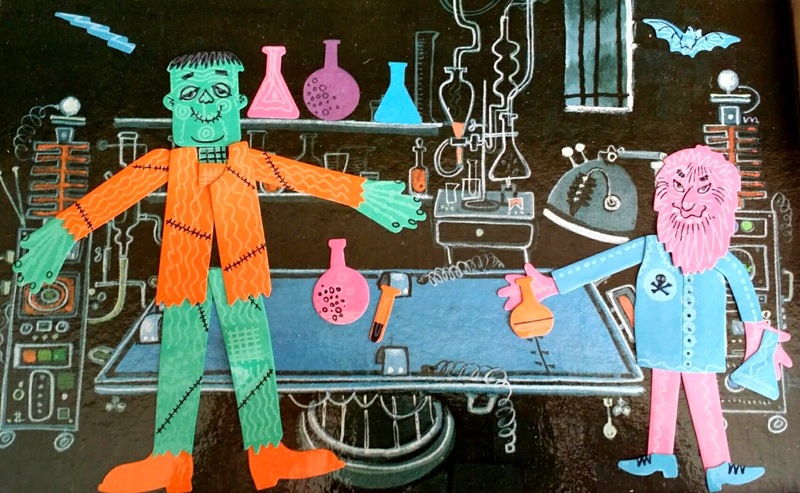 Classic movie monsters were all the rage in the 1960s, thanks in large part to the showing of Universal's 1930s-40s horror films on television. 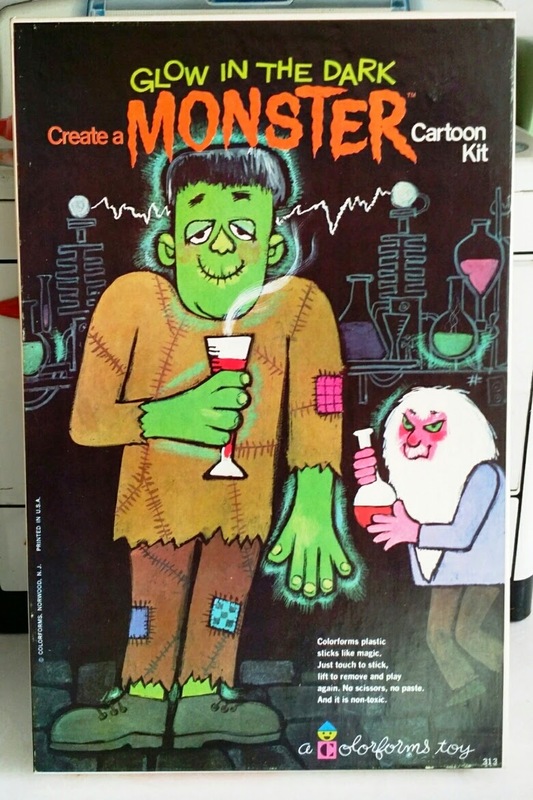 At the height of the monster craze, the Colorforms line of playsets, which feature removable vinyl pieces and cardboard backdrop scenes, came out with this fabulous item, the "Glow in the Dark Create a Monster Cartoon Kit." Inside the colorful box are a playboard, two sheets of vinyl character pieces, and an instruction booklet. The instruction booklet offers suggestions on setting the scene, and advice for parents on the wholesomeness of the activity set. Colorforms can teach children such skills as finger dexterity, sense of spatial relationships, and size matching, according to the booklet. I expect children could have cared less about those things, and were largely interested in the glow in the dark features. My set, purchased last year from the collection of a comic book artist, had never been opened, but that is no longer the case. How could anyone resist playing with this fabulous toy?! 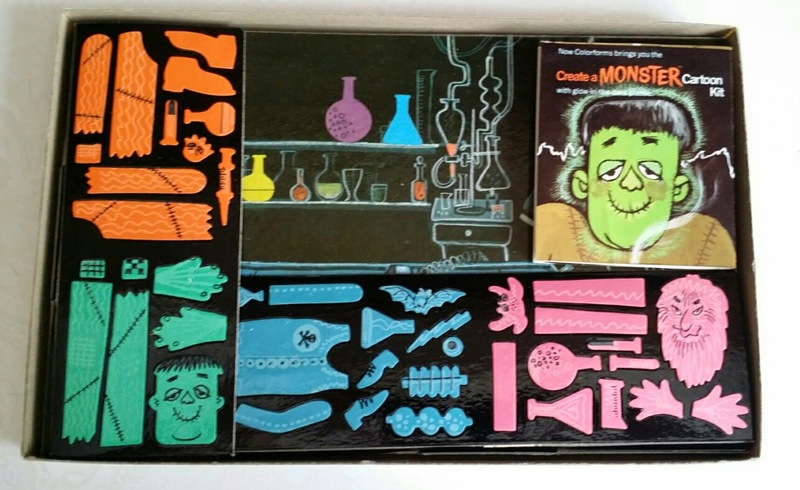 Click here to see another vintage Colorforms monster-themed set, the Castle Dracula Fun House, and here for an Addams Family set. Every fall I hope to add a piece or two, if I'm lucky on the hunt, to my collection of antique Halloween stuff. This year, I found a wonderful old candy container. 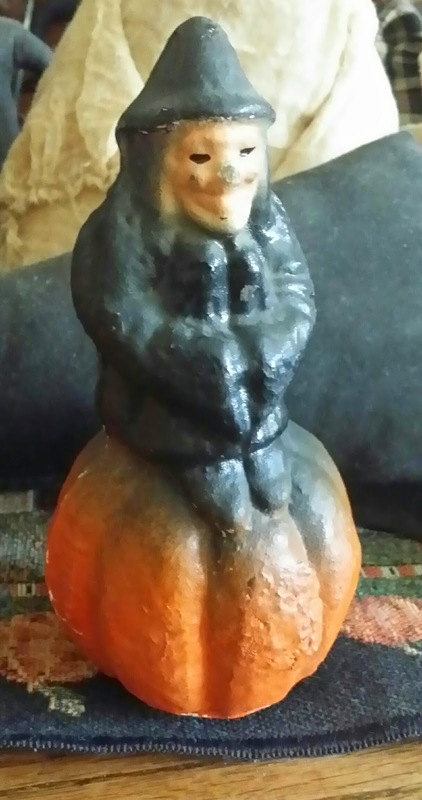 Measuring just under 6 inches tall, this container dates circa the 1930-40s, and features a black robed witch atop a pumpkin. It's made of a pulpy composition type material, like so many of the jack o' lanterns from this time period. 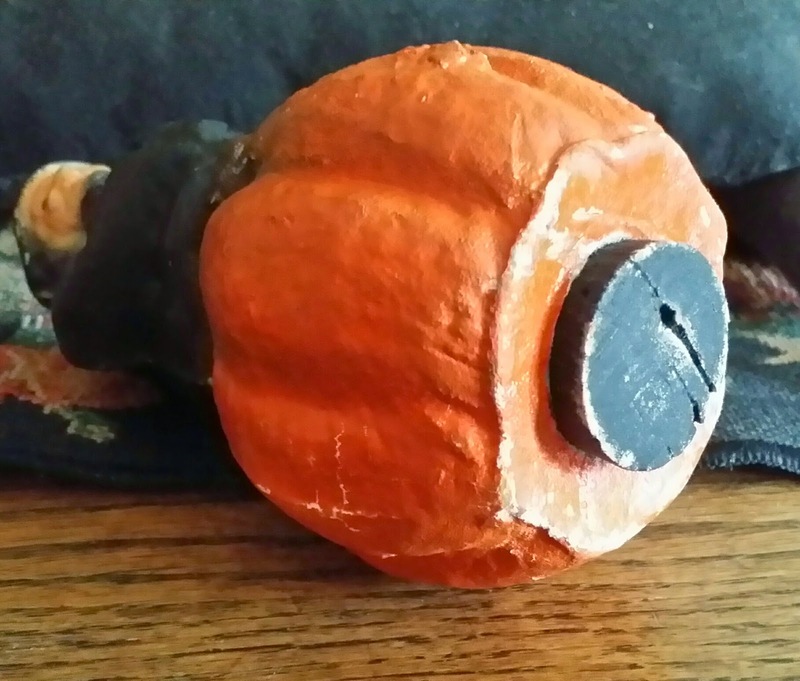 Originally it would have been filled with candy or nuts, and the young owner would have retrieved them by removing this wooden plug on the underside. Click here and here to see my other Halloween candy containers. Happy October! My favorite holiday will be here soon, so it's time to start posting Halloween stuff. I'll begin with an antique postcard I found recently. 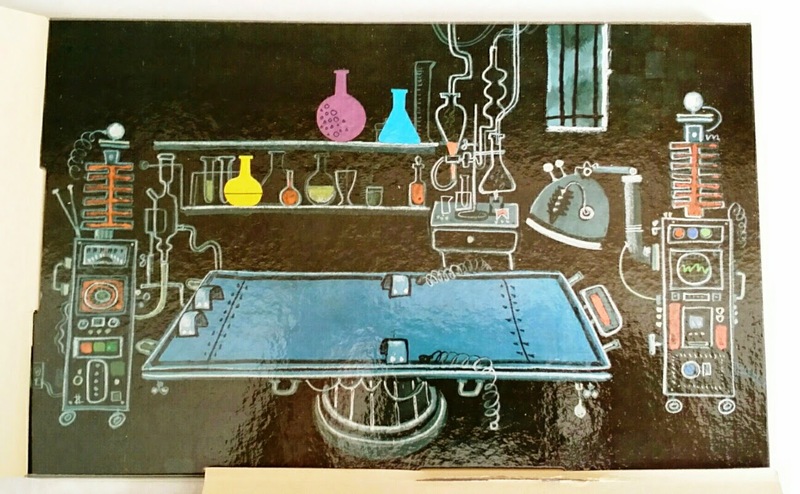 Even though the card is in rough shape, the illustration was an unusual one I hadn't seen before, so it was still worth snapping up, especially as it was only a couple of bucks. 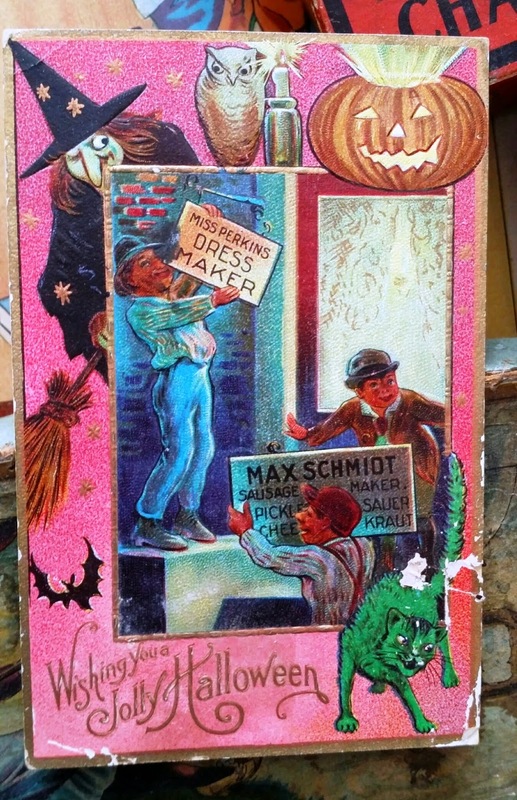 In this little scene, three mischievous boys are engaged in a classic Halloween prank: switching store signs. Here they are replacing a dressmaker's sign with that of a sausage and sauerkraut shop. Imagine the confusion the next morning. This card also features a wonderful, cartoony witch, and a bizarre, vivid green cat. Watch out for pranksters this month! More Halloween and spooky stuff to come. 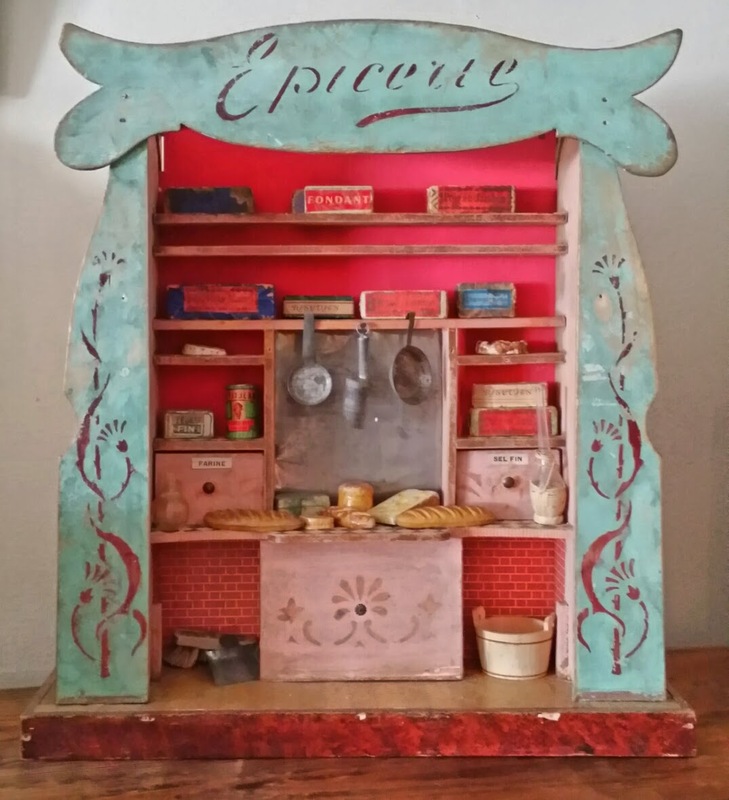 This antique dollhouse general store came from the collection of a woman who designed the toy department window displays for John Wanamaker in Philadelphia in the 1920s and 30s. This little shop was used in the famous department store's window displays, and later was a cherished plaything of the woman's children. 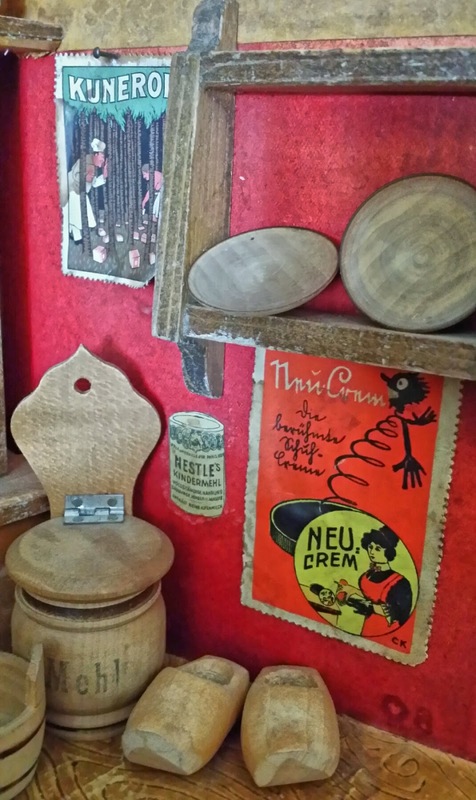 It dates circa the 1920s - early 30s, was made in Germany, probably by the Gottschalk company, and still retains its original floor and wallpapers. It is much smaller than most German dollhouse shops, measuring just 7 inches tall by 13 wide. But it's still big enough to be packed full of stuff, including boxes, bottles, and canned goods; pottery; dry goods containers; a tin scale; even a tiny pair of wooden shoes. 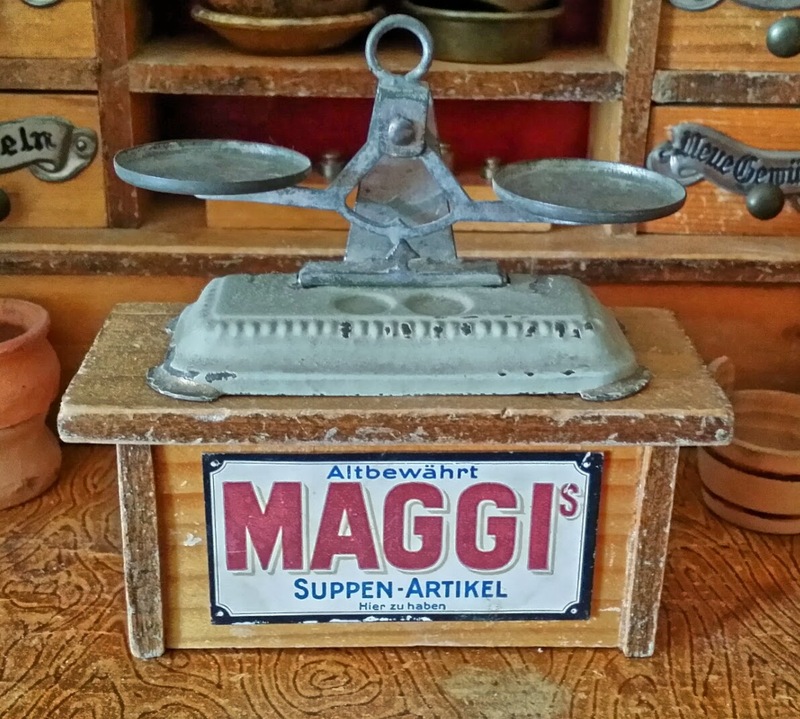 The "Maggi" name features prominently throughout the store, on canned goods, wall posters, and the front of the counter. Perhaps the whole store was a promotional giveaway sort of item for this company? 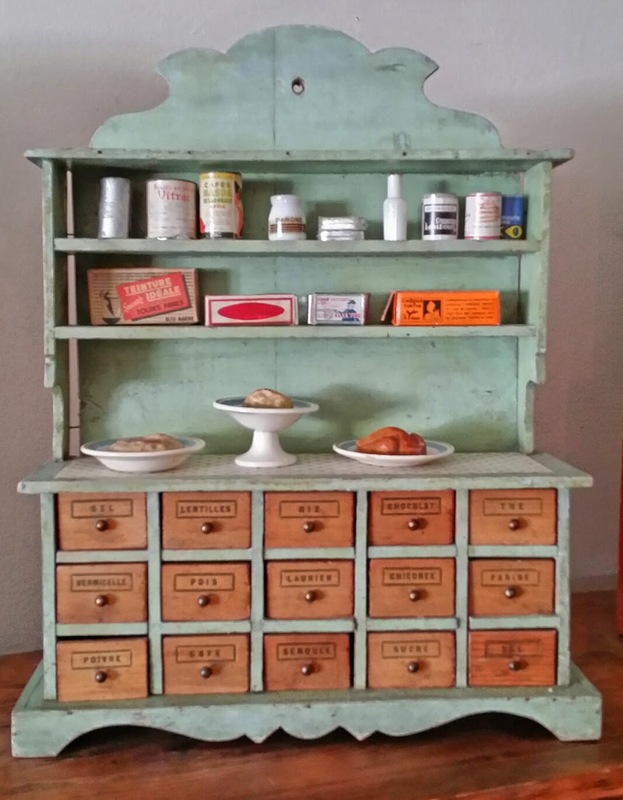 The six tiny drawers originally would have held loose dry goods like flour, rice, and salt, for little shopkeepers to practice measuring and dispensing. 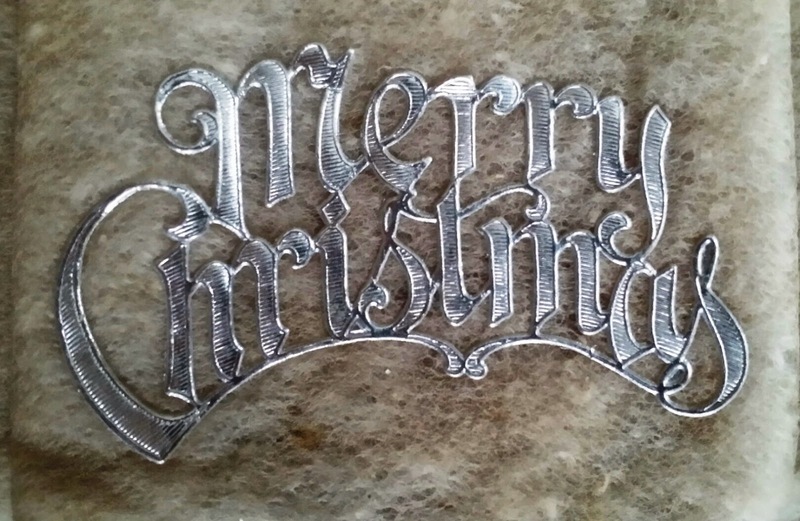 The silver ribbon shaped metal labels are a trademark of shops made by the Gottschalk company, and are seen on their items over many decades. 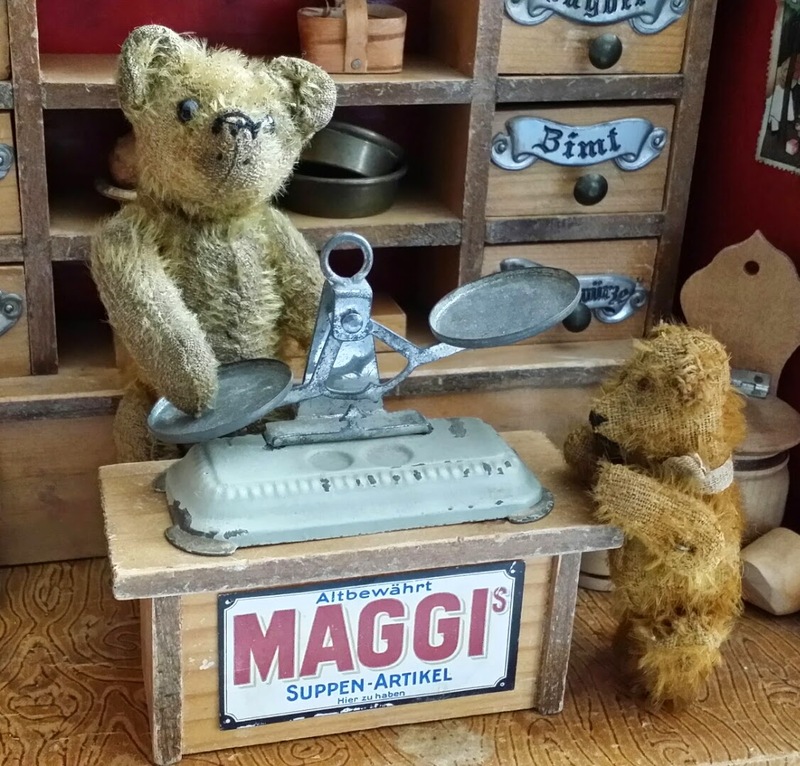 The little shop is just the right size for antique miniature German bears. A 1910 Steiff is behind the counter, about to weigh out some treats for his tiny customer. 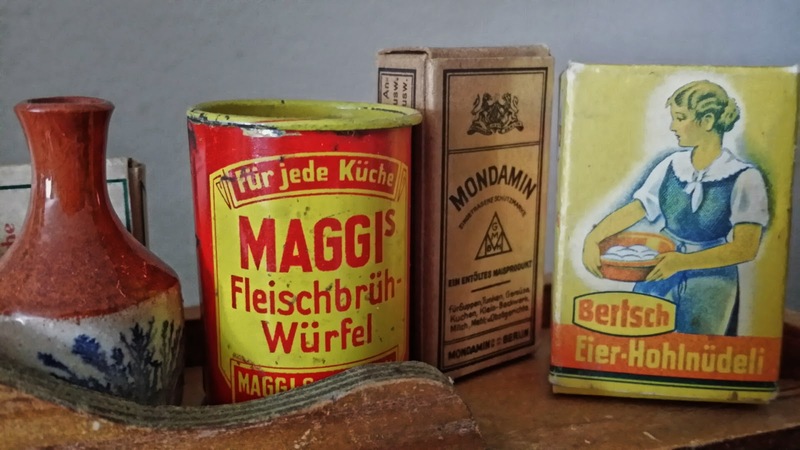 If you've read my blog for awhile, you'll know that I have a thing for antique miniature dollhouse shops, particularly the little toy grocery stores that were made in Germany for many years. 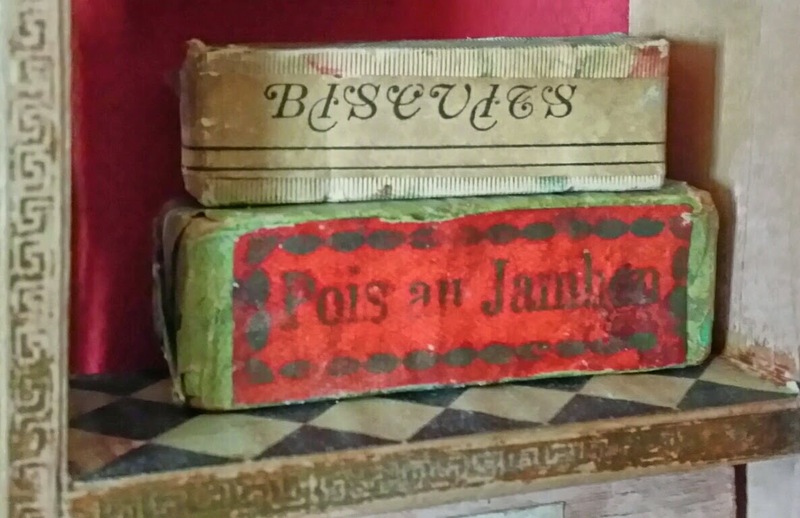 Here's something a little different: three miniature dollhouse stores that were made in France, circa the 1900s - early 1930s. 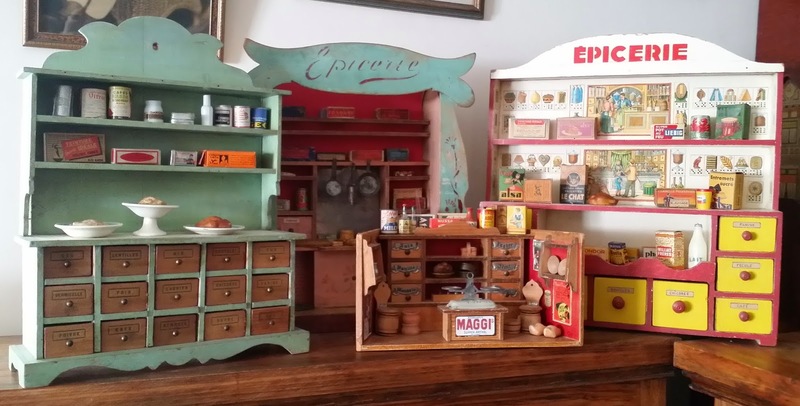 This type of store was called an epicerie, the French term for a grocery store or delicatessen, and the style was very different from the German, being more of a flat counter than a three dimensional room box. Along with the small German shop in the foreground, they all came from the collection of a woman whose mother had been the display designer for the toy department windows at the legendary John Wanamaker store in Philadelphia in the 1920s and 30s. These all featured in store window displays over the years, and later became playthings of the designer's family. They were lovingly cared for, and amazingly still retain most of their original items. Let's go shopping! We'll start with my favorite, the art nouveau styled shop, which measures 19 inches tall and dates circa the early 1900s. 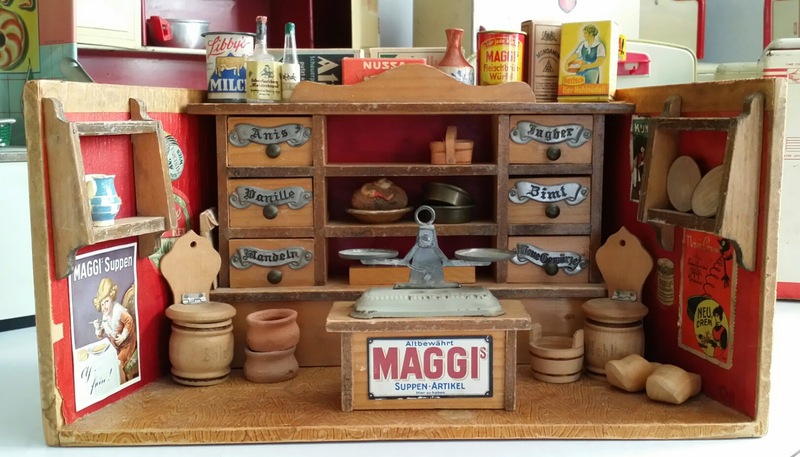 It features lovely stenciled designs, a faux wood grained paper covered base, and loads of original accessories including plaster breads and cheeses, glass bottles, tin utensils, and wooden packages of fondant, biscuits, and other delicacies. 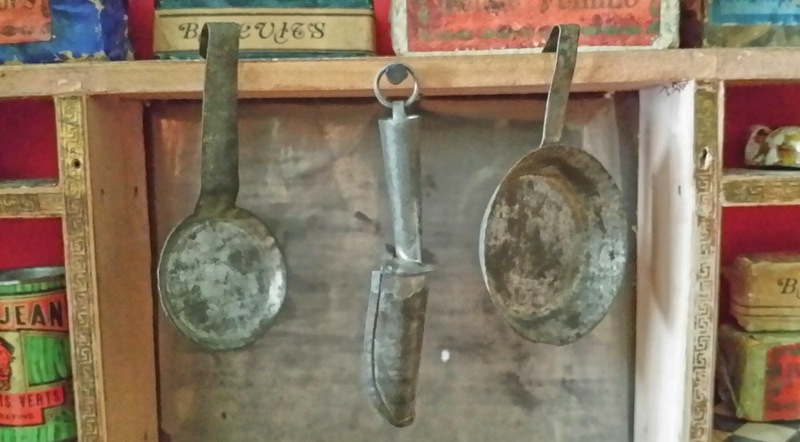 Tiny tin pans and scoops hang from a shelf. 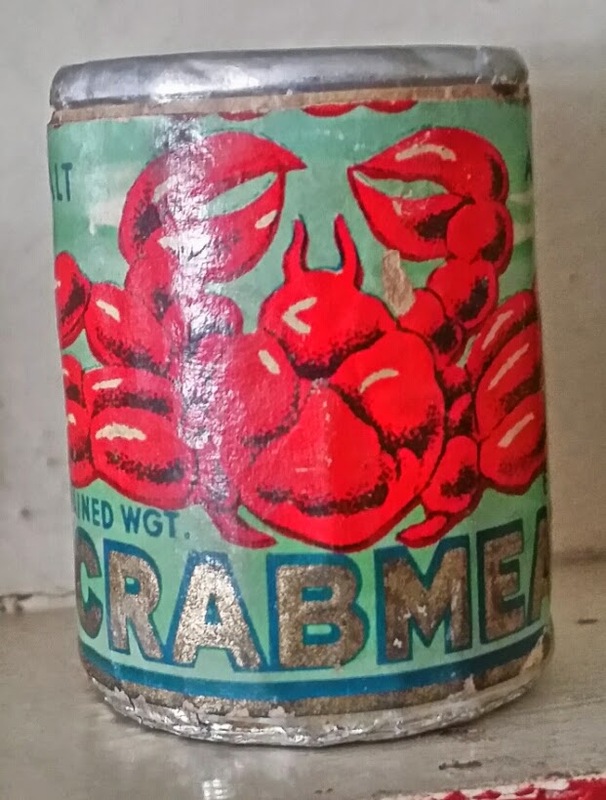 Look at the detail on the original shelf paper trim, and the label on the little can! 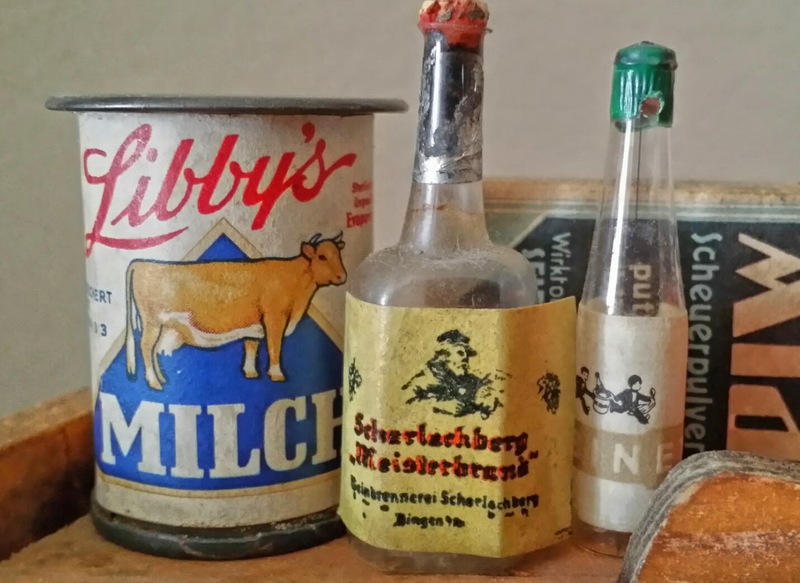 These delicate glass bottles, incredibly, survived nearly 100 years of display and play. 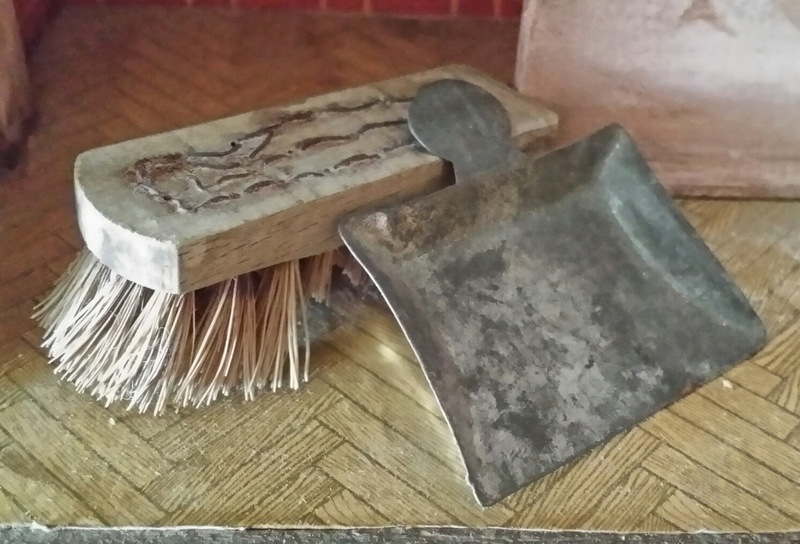 The shop came complete with a little dustpan and brush for cleaning up the day's crumbs. This beautiful store was the perfect destination for a French dolly who wanted some cheese and crackers, and maybe a little wine to go with them. 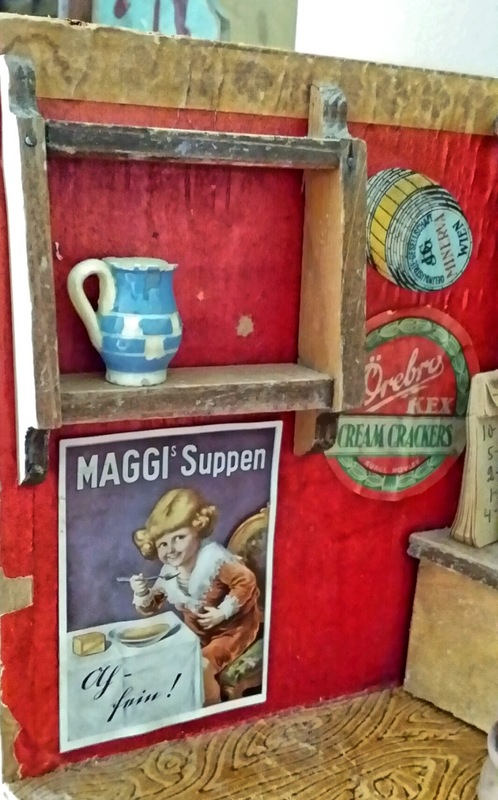 For a dolly that wanted to do some baking, this next shop might have been a better choice, as it features loads of tiny drawers that originally would have been filled with loose dry goods like sugar and flour for a child to scoop and measure out. This one dates circa the 1920s. This little chocolate box has an illustration of French comic character Tintin on the side. 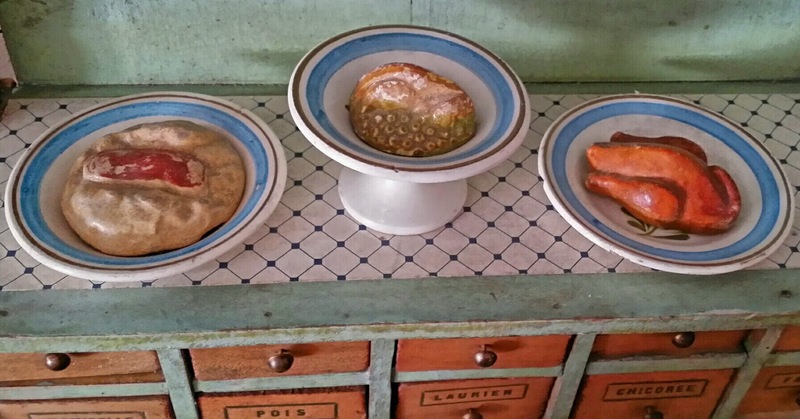 This store came with beautiful glazed porcelain dishes holding plaster foods. They display nicely on the long counter that runs the width of the shop. 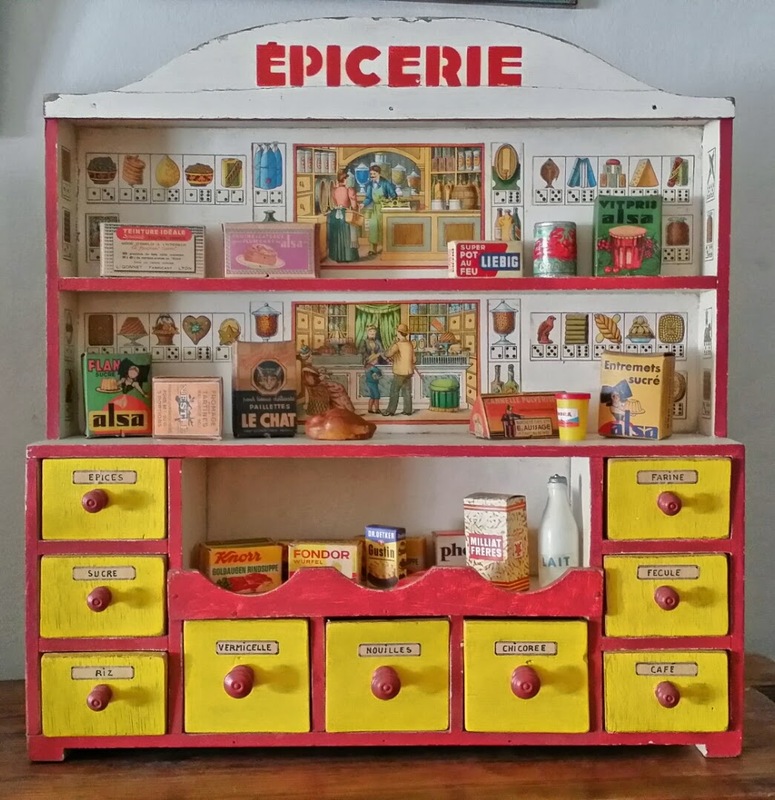 The last epicerie is very unusual, circa the early 1930s, and I thought it was actually homemade due to the handlettering on the drawers and the poorer quality of the painting. I've since seen another just like it but without the lithographed papers on the interior. My guess is it was made at home from a kit or plans in a magazine, which was a bit of a trend for dollhouses of this time period. The lithographed papers are what make this one special. 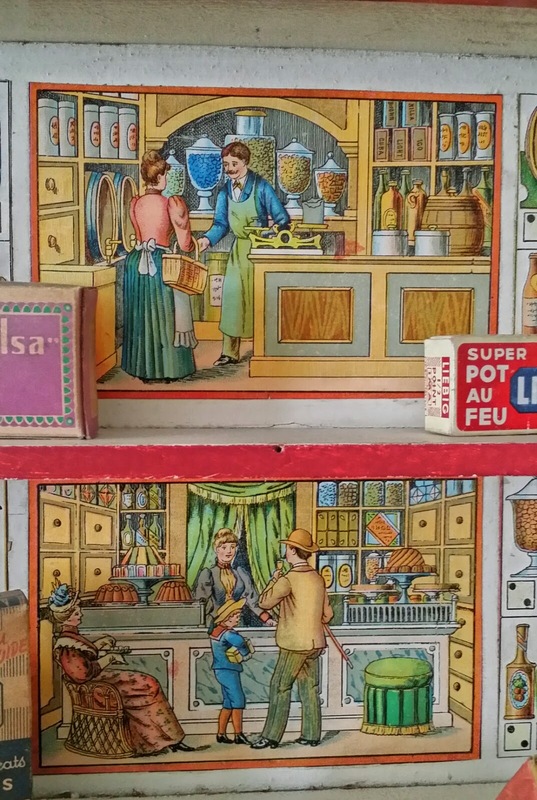 They feature beautiful illustrations of much earlier times, showing Victorian era shoppers at their own grocery stores. This shop appears to be the one the children of the window designer played with the most, as it came with added products from the 1940s and 50s. 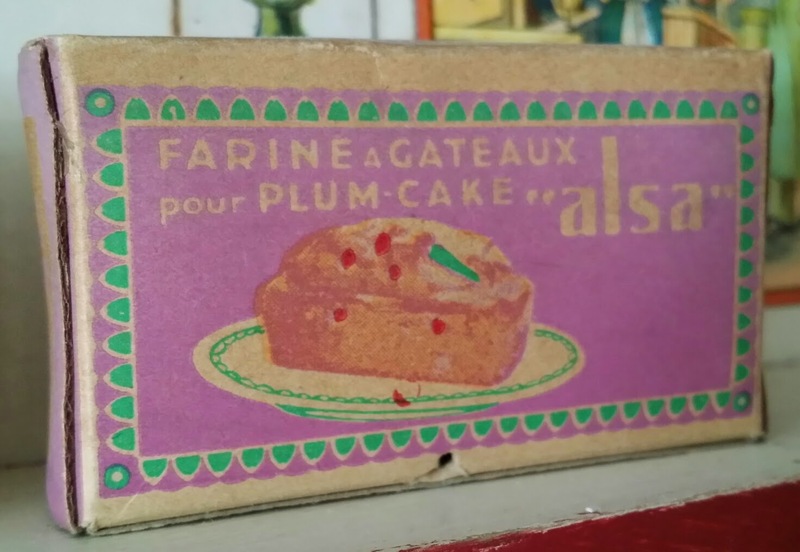 The likely more original packages include a little can of tinned crab meat, triangular cheese boxes, and a plum pudding. That's the end of our epicerie tour. I'll post the little German shop separately. Now I'm off to do my real life grocery shopping, which isn't nearly as fun as this was!